Demonstrate that you are a disability confident employer and raise your profile as a disability confident company using our 'Working in Partnership' logos. Our calendar of events is available to view on the website, enabling you to plan ahead. 6 weeks prior to each event you will receive an invitation email with details of how to register. If you register for an event, this will be followed by an email a week before the event with the final details of logistics for the day. Anyone from your company can attend the events within your membership allocation. For a reminder of the number of complimentary places you are entitled to see the 2019 membership benefits on the Membership Package page. If you joined or renewed in 2018 please email lise@myplusconsulting.com for a reminder. Platinum and Gold members are entitled to In-house training or Consulting, dependent on the membership level. Helen Cooke, Director of MyPlus, will contact you in the early stages of your membership to discuss how you wish to progress. Available as interactive pdfs that are password protected they can be shared with colleagues within your organisation who would benefit from the content and/or will play an integral part in progressing your disability agenda. The Toolkits are exclusive to members of the MyPlus Recruiters' Club and we ask you not to pass them on to anyone outside of your organisation. The purpose of this toolkit is to help you understand what being a disability confident student recruiter means in practice, and what the practical steps are to achieve this. The toolkit provides a step-by-step guide to achieving disability confidence in each of the 8 key focus areas allowing you to easily understand what you need to do, and enables you to measure your own progress. As well as an in-depth interactive pdf version this toolkit is also available in a ‘Quick Reference Guide’ desktop summary version. Platinum and Gold Recruiters' Club members are entitled to 2 copies of the Desktop 'Quick Reference Guide'. New members will receive these in the post. Email lise@myplusconsulting.com if you wish to purchase more copies. The purpose of this toolkit is to provide you with information, resources and guidance to enable you to effectively market yourselves as employers of choice to the growing number of students who have a disability. The toolkit consists of various ‘tools’ including; a guide to engaging with disabled students, disability briefing notes for campus representatives, a slide for marketing presentations, an A5 flyer that can be branded and disability-related FAQs which can be used on employer’s careers websites. The toolkit also includes use of the MyPlus Students’ Club logo enabling employers to link through to their profile on the MyPlus Students’ Club. Members of the MyPlus Recruiters’ Club have the opportunity to showcase your business as a disability confident employer on the MyPlus Students’ Club website. 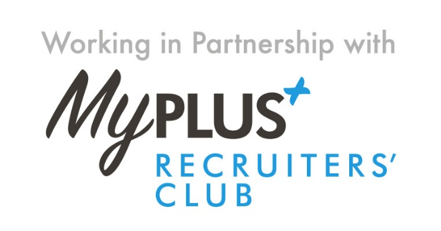 The different membership options allow MyPlus Recruiters’ Club members to create a company profile and advertise jobs and careers event on the Students’ Club website. We also encourage you to include case studies of employees with disabilities in your profile. Inclusive benefits can be viewed on the Membership Package page. Upon completing your membership sign up form, the main person you have provided for the Students’ Club will be contacted by our MyPlus Students’ Club Content Manager, to start the process of completing your profile. Dependent on your membership package you can add job and careers events adverts throughout your membership year. Complete the documents below and email to jo@myplusconsulting.com to do so. Jobs Proforma Form - The MyPlus Students’ Club Jobs Listings page enables you to attract a wider talent pool by advertising jobs to students and graduates with disabilities. Events Proforma Form - Featuring your careers, campus and digital events on the MyPlus Students’ Club website is a great way to engage with disabled students. Your event will appear in your employer profile and on the events page on the MyPlus Students’ Club website. Employee Stories Proforma Form - One of the most powerful ways to demonstrate your commitment to being an employer of choice for individuals with disabilities is through role models. Employees who are pursuing their career ambitions in spite of disability can share their experience and offer advice to graduates on your employer profile. Employee stories will also appear in the MyPlus Students’ Club stories page on the website. On a quarterly basis we send our Recruiters’ Club newsletter to the main contacts you have provided for the Recruiters’ Club and Students’ Club. If you wish to add other key people from your organisation to the mailing list send their email address to lise@myplusconsulting.com. We also have a non-member MyPlus Newsletter.